"An extremely rich, yet delicious cookie bar!!" "Whenever you make these cookies for someone, be sure to bring along..."
"...filled with sweet goodness, and topped with chocolate." 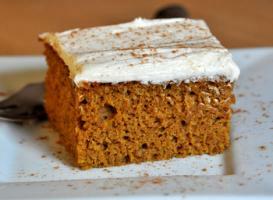 "Great tasting and a definite twist for gingerbread! "This cake won me First Prize at the county fair last year." "Moist brownies are topped with a layer of mint creme and a rich..."
"Fluffy cream cheese filling sandwiched between two moist pumpkin cookies make these..."
"This is my Aunt's recipe for a delicious light pumpkin tart, perfect for Thanksgiving!" "The cake is extremely moist and tender, with a fluffy crumb that melts away..."
"The cookies make a great conversation piece. My guests loved them!"